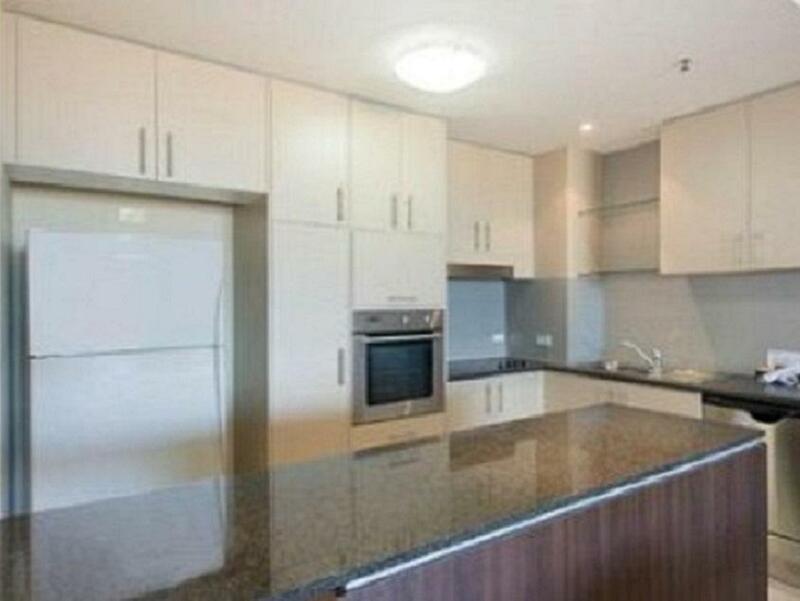 يقع The Grand Apartments Gold Coast في لابرادور, جولد كوست, هو خيار شائع بين المسافرين. يمكن من هنا للضيوف الاستمتاع بسهولة الوصول إلى كل ما تقدمه هذه المدينة النابضة بالحياة. سوف يعشق النزلاء موقع هذا الفندق، فهو قريب من أهم المعالم السياحية في المدينة كمثل سبايت, Surf In Paradise, Get Wet Surf School . 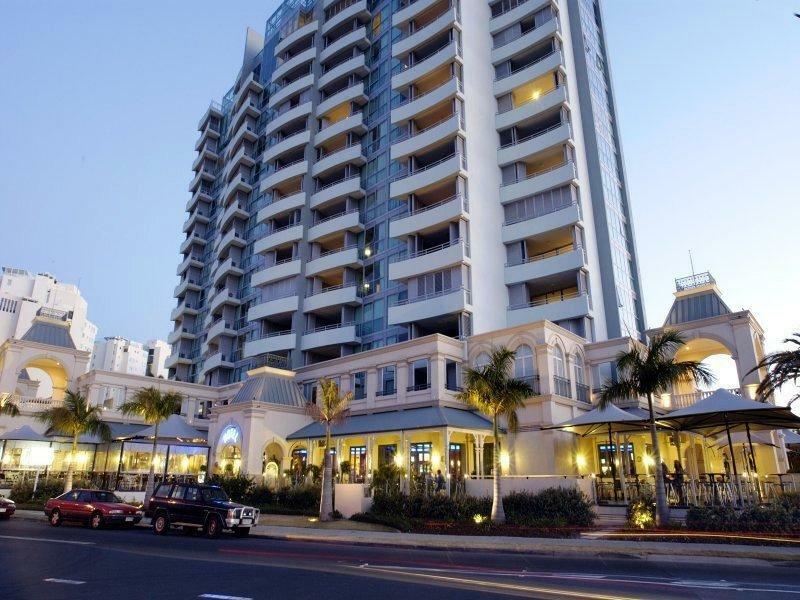 إن الخدمات الممتازة وحسن الضيافة العالي في The Grand Apartments Gold Coast تجعل إقامتك تجربة لا تنسى. هذه بعض الخدمات الموجودة في هذا الفندق: مرافق مخصصة لذوي الاحتياجات الخاصة, تخزين الأمتعة, واي فاي في المناطق العامة, صف السيارات, التوصيل من وإلى المطار. تتضمن كل غرف النزلاء وسائل الراحة والتسلية المصممة خصيصاً لضمان الراحة القصوى للضيوف. صممت خدمات الاستجمام في الفندق والتي تتضمن مركز للياقة البدنية, ساونا, مسار جولف - ضمن 3 كم, حمام سباحة خارجي, صيد السمك لمساعدتك على الاسترخاء والراحة. 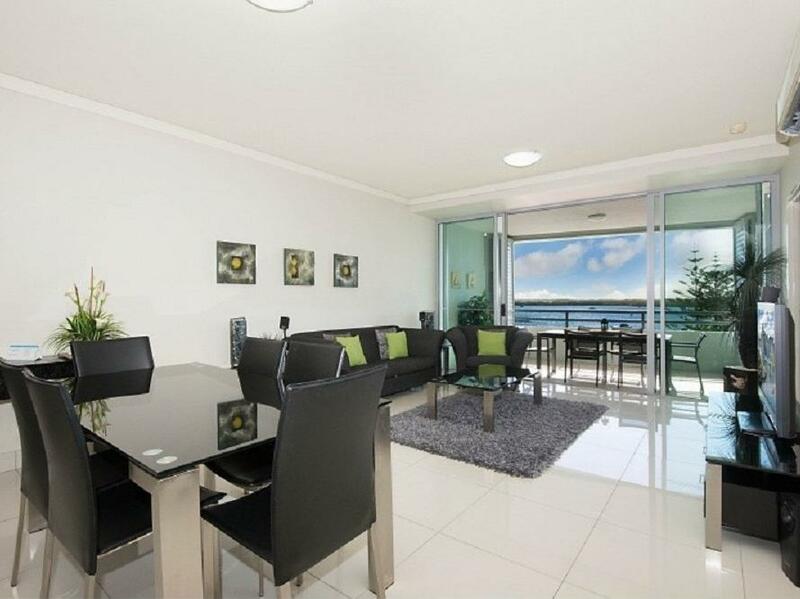 إن The Grand Apartments Gold Coast هو خيار ذكي بالنسبة للمسافرين إلى جولد كوست، بما يوفره من إقامة هادئة ومرحة. After hours check in and check out was difficult. Seems unusual not to have someone at reception over a weekend? Only 2 negatives. No air con in bedrooms Poor WiFi Everything else .. fantastic!! Thank you for you review Glen. we are happy you enjoyed your stay with us. Most rooms have fans in the wardrobes but we do have extras if required. We hope to see you again soon. The facilities are really good. A good swimming pool and spa as well as a bbq area. As a family of 5 going away at Xmas time can be pricey but I found The Grand Apartments to be very fairly priced. Our room was very clean, modern & our balcony view was beautiful. Great swimming pool & the little swimming area across the road with a park was a hit for the children. The only thing we weren't thrilled with was that there were no ceiling fans in any of the rooms & only 1 pedastal fan in a cupboard. The lounge room did have air conditioning though, so because the nights were quite warm we had to sleep with it on all night which didnt suit everyone. Also, you only get a small amount of Wifi which ran out pretty quick considering there were 5 of us. These were only small, fixable things though & we would definitely return for our next holiday. Thank you for your review Laura. We look forward to welcoming you and your family again soon. Thanks. Looking forward to staying at The Grand Apartments sgain. Sounds great Anna. Hopefully we will see yo again soon. Our appartment was directly above the bar which plays really loud music till 3am and on both nights we could hear th music clearly and the patrons yelling and fighting. The oven didn't work and the floors in the kitchen and bathroom were slimy. I especially booked the night for my husband's 60th birthday with the family. Very heartsore and unhappy with our stay at The Grand Apartments. The apartment 205 was above the hotel's lounge/bar where a live band played until approx. 1.30am. The customers than proceeded to carry on the party in the street until 3am. Reception told me in the morning that this room is cheaper because of this problem and Agoda should have this explained on their website. This I did not see when booking. The design of the apartment is not 2 x bedrooms but a enclosed room with shutters off the kitchen area. This room has no ventilation. If u leave the large sliding doors ooen, the front door whistles. 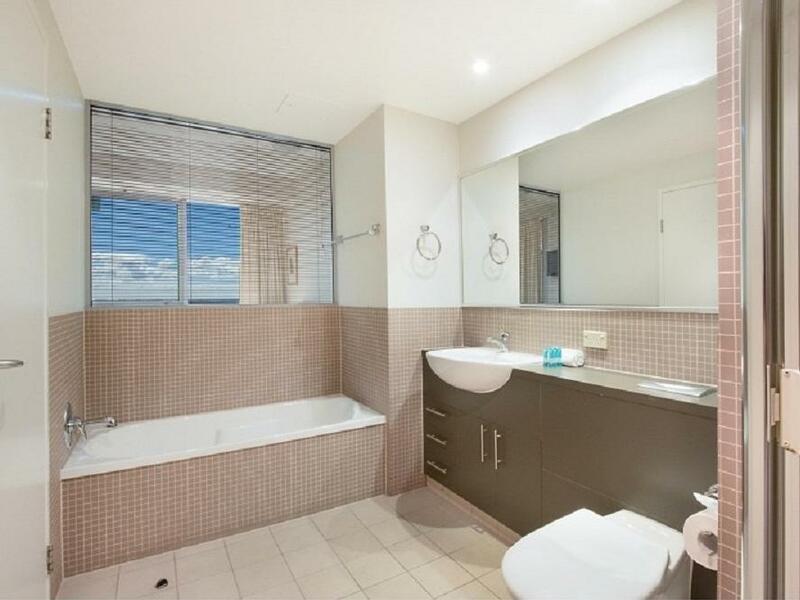 The bathroom has a very large frosted glass window on the main bedroom wall. If someone switches the bathroom light on during the night the whole bedroom lights up. The kitchen was very limited with crockery and cooking pots etc. Definitely do not recommend this hotel. We came for the GC marathon, the hotel did not disappoint. Staff were friendly on arrival, room had everything we needed and facilities were great. The hotel itself is nice with good facilities and location but if you like your sleep you best find somewhere else! The room was clean and had a great ocean view however it was poorly maintained with plaster peeling and water damaged. Check in was fine but check out was poor with a crash of their computer system and not even a 'how was your stay?'. At any rate, check out doesn't open till 9am and closes at 10am with a $1 per minute charge after that. We found 1 tiny milk in the fridge but it was already open and so unusable. The bed was small (double) and hard as a rock, but that was only a problem if you were trying to sleep over the loud music from the bar downstairs until 1am followed by 2 hours of drunken customers waiting for taxis...and that was clearly audible from the 8th floor! Overall it was disappointing and overpriced. There's plenty of other options if your after the same view. The hotel is lovely, the location is excellent and the staff were very good and efficient. However the furniture in the apartment was old and the lounge suite was very old with the couch basicly material covering the wooden frame and the chairs fragile and the mechanisms for the foot extension faulty. Mattress in the main bedroom was noisy with creaking noise every time you moved. The louvers on the balcony were stuck and could not be closed. The 2 bed apartment with shared bathroom is unsuitable for family with adult children as the second bedroom has little privacy. Cons: had a group of 4 people with a room that had 3 beds and were given 2 towels. Pros: the views were amazing. 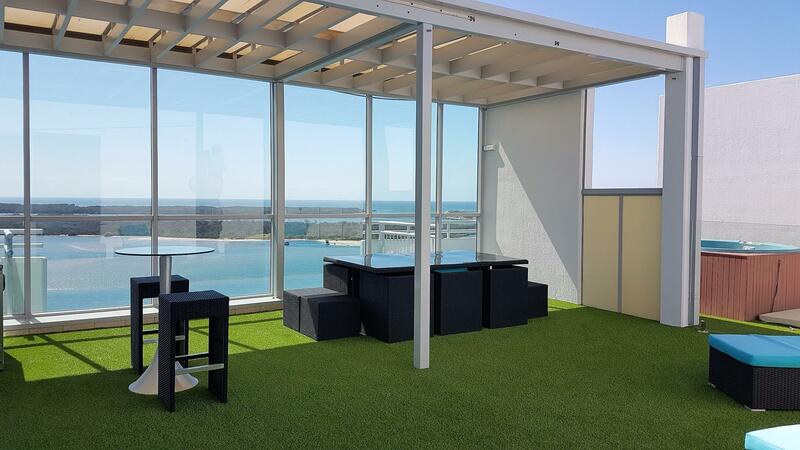 The unit was large and would easily sleep 4 adults without impacting on the living and dining areas. 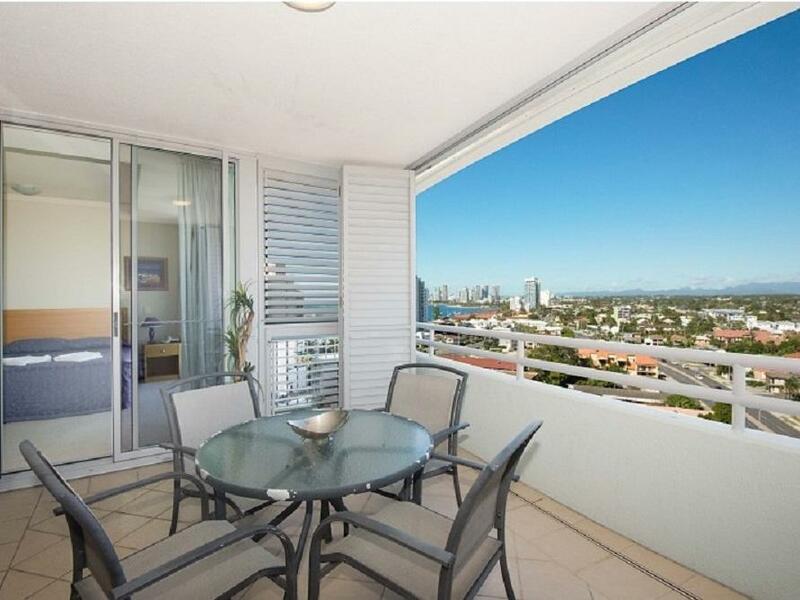 Good sized balcony with a great view of the Broadwater. There is some traffic noise if the balcony doors are open. There are good restaurants and cafes within walking distance. Really good pool and gym and there is a safe, calm swimming area across the road along with a great playground for kids. Good public transport and easy access to Harbour Town outlet centre. I've stayed here several times now with and without family and will keep coming back. Sadly when we arrived at the property at 3.15pm there was no staff and the directions to gain access to our accommodation were pathetic and very confusing................I do not regard Saturday at 3.15 a late check in and it definitely spoiled what could have been a pleasant stay as the location is beautiful and the apartment lovely. 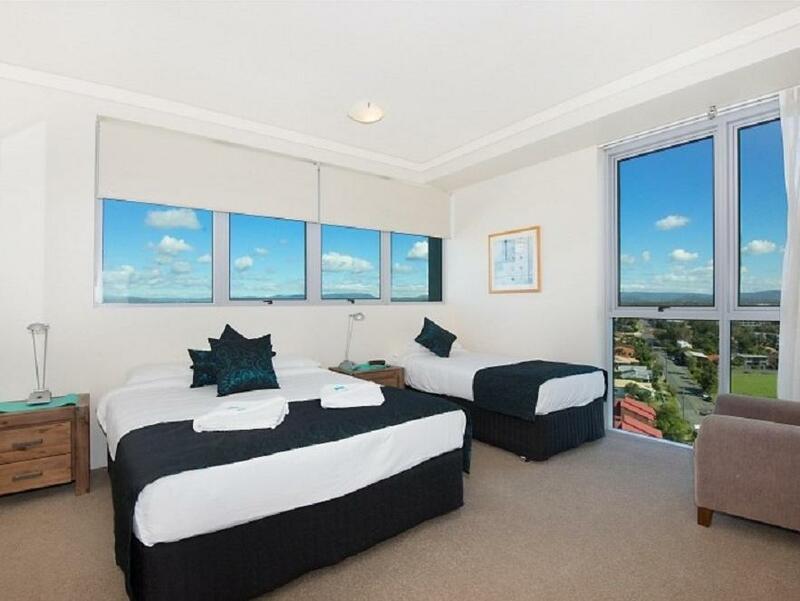 location is good can see gold coast beach, the top of SPA three room is very excellent. But all two room apartment bed room is no air condition that poor if in summer.